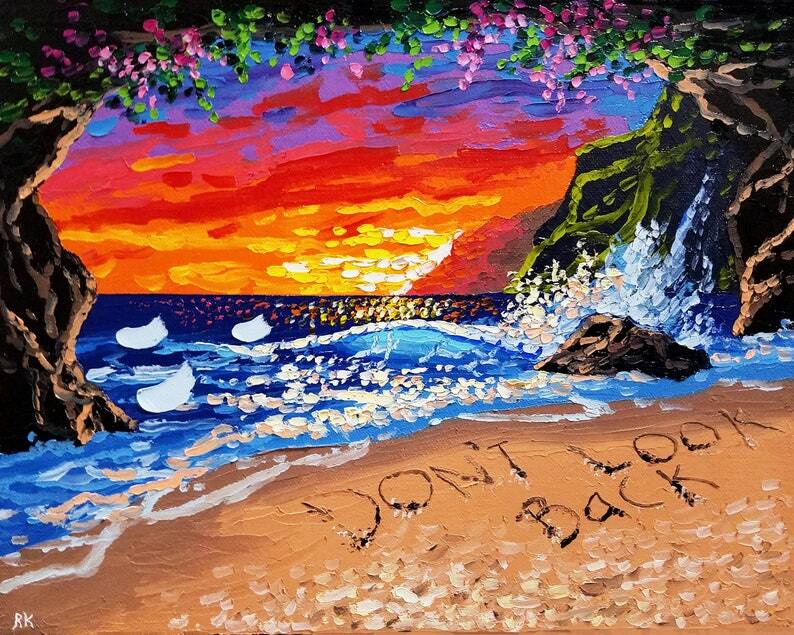 May this colorful painting remind you to never look back. To put the past to bed and look forward to the future. We all could use this affirmation from time to time. The sea cave and gorgeous sunset is the perfect backdrop for these words "don't look back" written in the wet sand. **This sunset art was painted using oil paints, with only a palette knife! It was created on high quality cotton canvas and is stretched and ready to hang. The sides of the oil painting are painted *black* to give the art a professional look. You can hang it right out of the box! **This beach art is 11 by 14 inches in size and comes with a certificate of authenticity, signed by me. The colors and rich textures of the painting make the work pop off the canvas. My 3-D style is very exciting and makes my art unique.